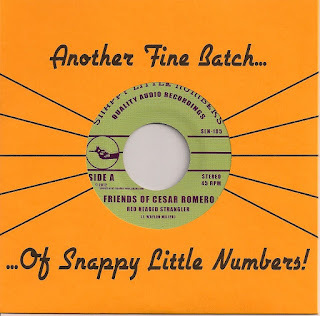 Snappy Little Numbers are extending their reach from Denver to Friends of Caesar Romero who started out when Joseph Kerr of relocated to Phoenix, AZ withand borrowed an 8 track cassette recorder. I love those giant unweildy machines, there's just something about hitting record and the wheels turning. I'm betting these couple of tracks were from some of those very sessions. Like Adam Widener, Joseph is whittling down huge barren chunks of gleaming pop punk into these under two minute bursts. "Red Headed Strangler" on the A-Side kicks off with a heavy metallic strum, keeping things all up in that treble side of the EQ. Joseph's vocals have this manic, high register layered quality that's just due to the bursting energy of this thing. I'm also kind of hearing that Matthew Melton layered harmony rising above the ham fisted power chords. It's all warm reverb and mad punching of these strings. Could have been a distant Hot Snakes cousin or going further back to that Rocket From the Crypt shiny chrome plated feel. The B-Side, "Tammys of Tomorrow" fades in some backmasked melody, is this the devil poking his head on that 8track cassette? This time FOCR is slowing things down a bit and getting into that way back garage sound...not in texture, though things are slightly peaking out, more in that chorus harmony. Still jabbing at chords, violently bobbing, but this high harmony stuff keeping it way away from anything sinister, or biker movie related. Throbbing kick and snare caveman style huge pounding, I can almost even hear a Kurt Heasley vocal thing going on here, but he's on my mind lately. That melancholy of unrequited garage love, surf guitar solo panned across the stereo field. I know how you feel. 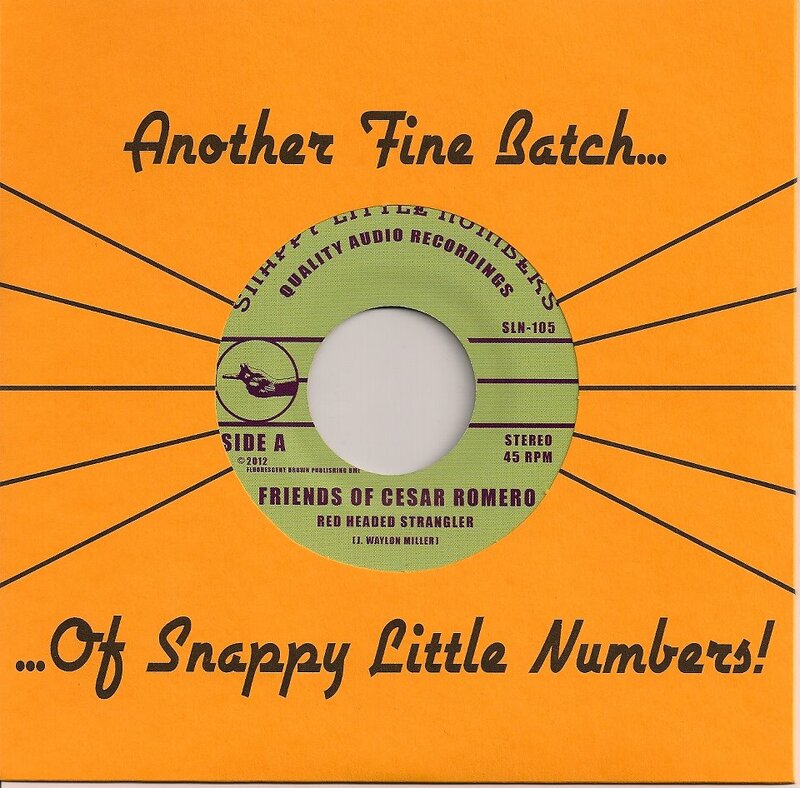 Snappy's signature factory sleeve on sort of a blue grey vinyl...that United Records mud color with messages in the gutter from Snappy Little Numbers Records.